Congratulations to DANA from Saturday Mornings! You are the winner of the FedEx & $25 American Express gift card! Just send me your address so I can get this to you in time to ship all of your gifts. By the way, I just checked out Saturday Mornings and love it! I love the photo puzzle idea that is posted right now and all of the other great ideas on the blog. o Use tape designed for packing, not duct or masking tape. Use the “H Tape” method to securely close all of the box flaps. o Do not wrap the outer box with paper or string, which can get caught in automated processing equipment. o FedEx Office offers a variety of the most popular packing supplies, including boxes, tape, bubble wrap and other essentials for purchase. Locations also provide free FedEx shipping supplies for FedEx Express shipments. o FedEx Office has shipping specialists trained in pack and ship best practices to give you advice or pack up your gifts for you. o The more than 1,800 FedEx Office locations across the U.S. offer a full range of FedEx Express, FedEx Ground and FedEx Home Delivery shipping options – with most stores open as late as 11 p.m. and 300 that are open 24 hours. o Customers have until December 17, 2010, to find and send that perfect holiday gift via FedEx Ground or FedEx Home Delivery. Last-minute shoppers have until December 23, 2010, to ship FedEx Express. o FedEx Office now offers two complimentary services that allow package recipients to pick up their items whenever it’s most convenient for them. o The Hold at FedEx Location service is great for customers who know their recipient won’t be home to accept delivery of a package. Customers can choose to have their FedEx Express or FedEx Ground package sent to a domestic FedEx Office store of their choosing before any delivery attempt is made. FedEx Express packages may also be sent to FedEx World Service Centers, including select international locations. Packages are held for up to five business days and a government-issued ID is required to pick up packages. o With FedEx Redirect to Hold, U.S.-based customers who missed a delivery attempt by FedEx Express or FedEx Ground or know they will not be available to accept a package at a given time can have the package re-routed to a local FedEx Office store. o Both solutions are provided to customers free of charge – an offering competitors cannot match. o Also, when shipping FedEx Home Delivery, FedEx Office can set up one of three convenient delivery options to ensure that recipients are home at the delivery time. For an additional charge, customers can choose FedEx Evening Home Delivery® for delivery between 5 and 8 p.m., FedEx Date Certain Home Delivery® for a specific delivery date and FedEx Appointment Home Delivery® for a certain date and time for delivery. These appointment options are not offered by any other competitors today. o Tracking a package for real-time delivery status and location information is easy and convenient on fedex.com. o In fact, more than six million package-tracking requests are handled on an average day – and even more during the busy holiday shipping season. o Customers can also confirm a package’s status by calling 1.800.Go.FedEx (1.800.463.3339). Look for eco-friendly solutions to cushion your package’s contents. FedEx suggests solutions such as shredded paper, biodegradable packing “peanuts” or light-weight used clothing. 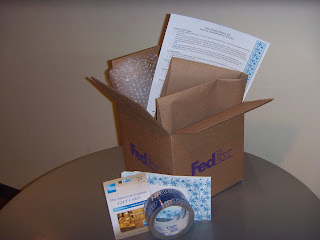 · Visit http://fedex.com/us/holiday/or http://news.van.fedex.com/holiday2010for more helpful holiday tips. I am going to keep this contest short so that the lucky reader will have time to ship their gifts with this great package. You have until Monday, December 13th to enter. For extra entries you can tweet, blog, or post on facebook about this contest. Just leave me a separate comment for each. Sweet! What an awesome giveaway! Timing couldn't be better! Ooh! Great givaway! and thanks for the tips! Thanks for the artical. Always have things to ship. i live in hawaii and have to ship everything! this is awesome, thanks! I do need to start shipping dont I? Christmas is coming quickly!! I shared your great giveaway on Facebook. with some family members in China and in England and in the US too this would come in handy for the presents my parents wants to send to their grandchildren. Like others have said, PERFECT Timing! This would be a big help with some of our gift giving...Thanks for this great giveaway! Great giveaway! This comes in very handy! Awesome giveaway, thanks for sharing. I still have a few gifts to send, so this would be wonderful! WOW, this would be a great help. yay! thanks for the giveaway. Thanks for the tips and the giveaway!! Great giveaway at the perfect time! Thanks for the chance to win. Fed Ex has reliable, dependable shipping service. Thanks for the chance, I have a ton of gifts to send this year! Totally fabulous, please enter me! Your post honestly reminded me I have to go to Fed Ex tomorrow! So, I already kind of won. I have a couple packages to ship for Christmas and this would be perfect! Thanks for the giveaway!! oh, i like this give-away. thank you too for all those fed ex tips! What a thoughtful giveaway! One person is going to be hooked up for shipping there gifts out this Holiday Season! Cool, i would like this package! id love to win, i ship stuff all the time! Thank you so much! Even my husband is thrilled that I won!!! !